I have lived in my current house (only house, besides the parent’s) for 4 years…Besides the parent’s house, which I have tendency to still call home, it is the longest time I have ever spent in one location. 2 years of dorm life, followed by 3 years in one apartment, followed by 1 year in another apartment across town, followed by 6 months in an apartment near by, before buying this here house. I fell in love with this house from the moment I walked in the front door. From the wide open space, huge kitchen island, and tons of natural light…I knew I would fit right in. And I have. However, up until recently, I have had no desire to decorate. None whatsoever. I have hung 4 pictures and painted my bedroom ( it was gold..no joke, like shiny jewelry gold…and it took me one year before I changed that…not kidding. ) My thought process was, why decorate and put holes into walls that you will have to repair one day when you move…even if you don’t plan on moving any time in the near future. I have a chair rail I want removed…it is seriously attached to the wall, I tried budging it…. Stairs I want to paint. Art that needs hung. Walls that need painting. A bookcase that needs erected. And the list goes on…However, instead of starting any of these projects, because lets face it, I’ll need help…I just walk back into the kitchen where I know what I am doing. Oh and speaking of the kitchen, I would like new counter tops…Argh! I am not too sure about this new found desire to make this house my own. Today, instead of doing/starting any of the above mentioned ideas – I think it’s best to start after the holidays, isn’t procrastination great! 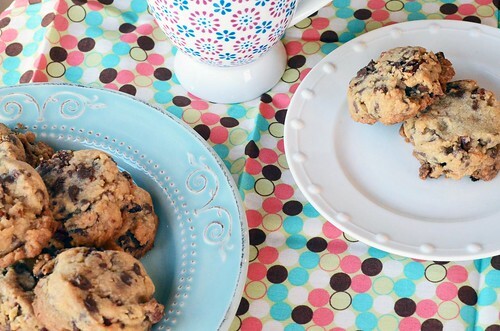 – I made more cookies. Go figure, right?!? This is like cookie #8, but it feels like #167! For cookie #309, I made pecan sandies. I added mini chocolate chips because this is how my mom enjoys them. And who doesn’t love mini chocolate chips…a bit of chocolate with each bite. yum!!! My mom is totally onto something here. 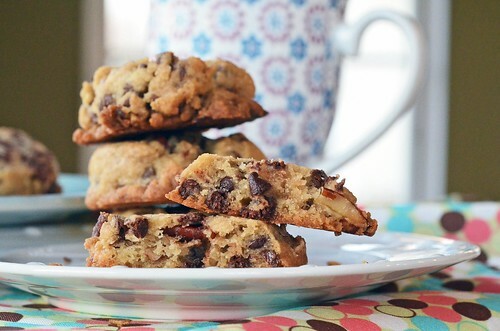 Pecan sandies were meant to be dunked in a glass of cold milk or a cup of hot cocoa. So, go ahead, dunk away! In a large mixing bowl, beat together butter and brown sugar, until light and fluffy. Add vanilla extract and salt and beat until combined. With mixer on low, slowly add flour. Beat on medium until dough begins to come together. The dough will be crumbly, very crumbly. 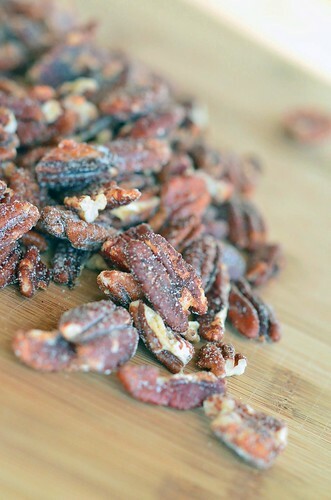 Fold in chopped pecans and mini chocolate chips. Scoop cookies out onto parchment lined (optional) cookie sheet about 2 inches apart. 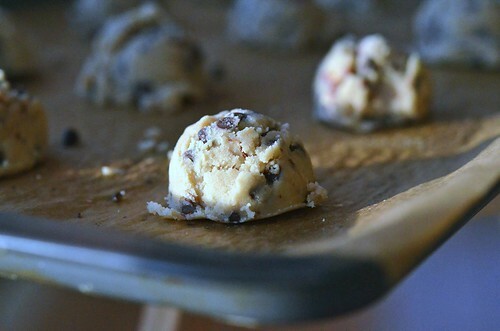 ( A cookie scoop works well here, but you will have to firmly press dough into scoop, so the cookie doesn’t fall apart when you place dough on cookie sheet. Or you can just roll dough into balls using your hands…both work quite well!) 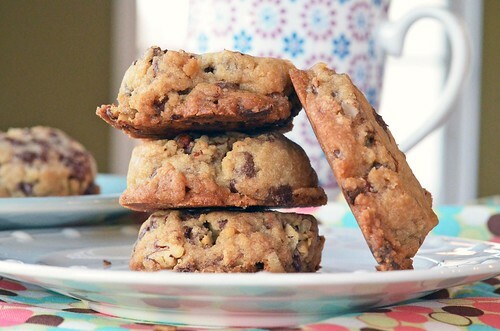 With the bottom of a cup, slightly flatten each cookie. Bake in preheated oven for 12 to 15 minutes. Remove from oven and let cool slightly on cookie sheet before transferring to cooling rack.